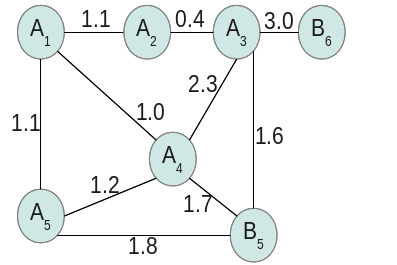 Nodes B6 and B5 were not removed, even though they are B-type nodes, because they do not have exactly two neighbors. The weights of the new edges are the sum of the weights of the removed edges. edge is equal to the sum of the removed edges' weights. This code is going to be part of a company-internal project, so I had to remove descriptions of what the actual node types are, and have described them as "A-type" and "B-type". The only differences between this code and what will be used are the regular expression for determining node type, and the node type references in the docstring/comments. The set-of-edges representation can't represent all graphs! If there's an isolated node (a node with no edges) there's no way to represent it. but nodes appear in this iteration multiple times (once for each edge incident to the node), so you have to de-duplicate the nodes by storing them in a set. # Map from node to set of its adjacent nodes. """Return True iff the graph contains the node n."""
"""Return an iterator over the nodes of the graph.""" """Return the number of nodes of the graph.""" """Return an iterator over the neighbours of the node n."""
"""Return the number of neighbours of the node n."""
"""Remove the node n and all incident edges.""" """Return the representation of the edge between nodes n1, n2.""" """Return True iff the graph contains an edge between nodes n1, n2.""" """Return an iterator over the edges of the graph.""" """Return the number of edges of the graph.""" """Return the weight of the edge between n1 and n2.""" """Add an edge between nodes n1 and n2 with weight w."""
"""Remove the edge between nodes n1 and n2.""" # Build graph from edge set. # Remove B-type nodes with exactly two neighbours. # Return modified edge set. The code would be even simpler if you were able to use the adjacency list representation throughout your program: then you'd be able to drop the conversion steps. 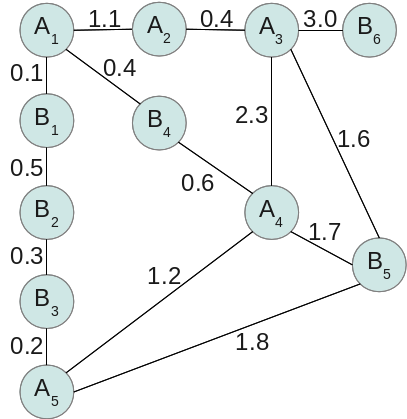 The result is not a valid graph: it has two edges between the same pair of nodes. You'll see that my revised code above tests for this case and does nothing if so. But maybe it should raise an exception? Maybe the old edge should be replaced with the new edge? Or maybe only if the new edge has a smaller weight? Because you've concealed the details of your problem, I can't tell what the right thing is to do here. Not the answer you're looking for? Browse other questions tagged python python-3.x graph or ask your own question.